Lao Cai (VNA) – The 17th Vietnam-China International Trade Fair will take place in the north-western border province of Lao Cai from November 10-15 under the theme of “Integration – Cooperation for Mutual Development”. The annual event is rotationally held by Vietnam’s Lao Cai province and Hekou district of China’s Yunnan province as part of the national trade promotion programme 2017. 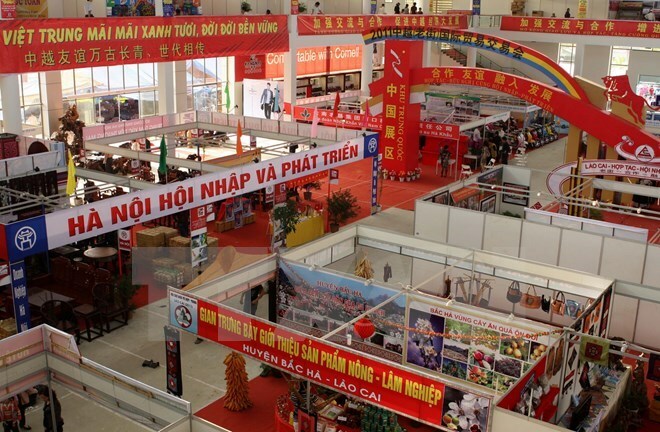 Deputy Director of the provincial Department of Industry and Trade Nguyen Truong Giang, who is also deputy head of the organising board, said the fair will house 600-800 pavilions of 20 Vietnamese and Chinese cities and provinces. Businesses from Taiwan, the Republic of Korea, and Thailand will also showcase their products at 66 booths, he added. A wide range of products will be offered for consumers, focusing on the fields of agro-forestry-aquatic products, medicines, equipment and machinery, construction and construction materials, electricity, electronics and information technology, food and beverages, home appliances, healthcare products and services and handicrafts. During the trade fair, there will be a trade and economic talk between Lao Cai and Yunnan provinces, a trade conference between Vietnamese and Chinese enterprises, a tour of key tourism destinations in Lao Cai, and a reward ceremony for the design contest of Lao Cai souvenir products.